In an instant our world changes as we know it. We become mothers once we see the positive pregnancy test. We begin planning and dreaming the moment we know a baby is growing inside us. I’m 36 years old, and pregnant with my last child. (At least that is the plan) And, this time I wanted my pregnancy to look different than the others had. I have never made exercise a priority during my previous pregnancies. With my first pregnancy, I simply stopped doing what I was doing prior to getting pregnant. I don’t remember making a conscious choice to do so, I just never really made it back to the gym! With my second pregnancy I suffered with chronic back pain that left me totally sedentary because of sciatica that was only made worse with activity. So, when I saw those 2 pink lines last summer… I made a commitment that this time it would be different. Not only because I wanted it to be, but because I couldn’t imagine going months without stepping foot into my Bar Method studio. I joined Bar Method when my youngest was 18 months old. What started as an idea from my chiropractor to build my core, ended up becoming something so much more. I became someone new when I joined The Bar Method. 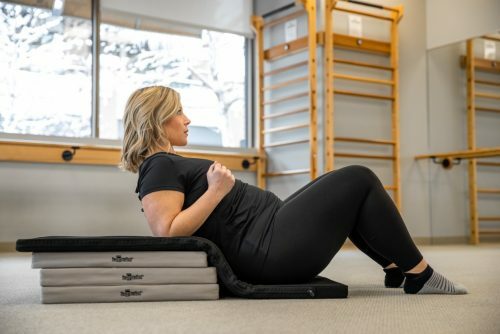 After being a Bar Method member for almost 2 years I knew that I’d built a solid foundation to support a pregnancy, despite my previous pregnancy and back pain. Bar Method had given me confidence that I had strengthened my core and would be able to continue my practice throughout my pregnancy. Today, I’m 36 weeks pregnant with our little girl and I have continued my Bar Method practice my entire pregnancy. I’ve made a commitment to go to classes 2-4 times each week during my pregnancy and I am so proud of myself for keeping this commitment to myself. I’ve not only kept my muscles and core strong, but also, I’ve continued to take care of myself emotionally because my Bar Method workout is my happy place! I take a Prenatal Bar Method class once a month and am so thankful for the modifications available for expectant mothers. During my first prenatal class the instructor Sara said, “Your body is working perfectly for you” and it brought me to tears. She was right. Instead of focusing on my growing body in a negative way, I’ve chosen to spend my pregnancy focused on how strong body is and how thankful for all I am able to do while carrying my daughter. The Bar Method offers modifications and props that make it possible to continue my practice as long as I feel comfortable to do so. I took the modifications at my own pace and have always felt supported by the instructors and their expertise as to what is best form and practice for me. I am so thankful that they are looking out for myself and my baby’s best interest while I’m in class. When I deliver my baby girl in April my hope is that my weekly Bar Method classes have prepared me well and will make my c-section recovery smoother than ever. Many women at my studio have shared with me that The Bar Method made their deliveries and recoveries much easier and I am excited to see how my body responds as well. I am thankful for a safe and effective workout that has kept me strong throughout my pregnancy and I know that as soon as I am able, I’ll be back at the barre after delivery to restore my strength postpartum. Experience the same safe & mother approved workout as Amy and find a Bar Method studio near you.